Baking and Cooking, A Tale of Two Loves: Spiced Pumpkin Bread with Rum Baked Apples! I always bake pumpkin bread in the fall and I make a loaf for my son that doesn't like chocolate. Inevitably. something chocolate shows up at dessert on Thanksgiving. This year we are having a small group. I think, so I wanted to change a few of the side dishes I found this recipe for a Spiced Pumpkin Bread with Baked Apples in one of my Cooking Light cookbooks. I had never made this recipe before, but it only had 2/3 c. oil for two loves of bread. I then changed the oil to 1/3 c. and added 1/3 cup of applesauce I got from my Jars of Love. Also, I added 1 c. total of craisins. This bread is so moist and flavorful and full of craisins. Then when you make the Rum Baked Apples and put them on top of a warm piece of the Spiced Pumpkin bread, it's pure heaven. This would make a beautiful presentation on a Thanksgiving dessert table. Lightly spoon flour into dry measuring cups; level with a knife. Combine flour and next 7 ingredients (through nutmeg) in a large bowl; make a well in center of mixture. Combine canola oil, applesauce, eggs, and pumpkin in a medium bowl; stir with a whisk until smooth. Add to flour mixture, stirring just until moist. Fold in craisins. Spoon batter into 2 (9 x 5-inch) loaf pans coated with cooking spray. Bake at 350° for 1 hour or until a wooden pick inserted in center comes out clean. Cool loaves in pans 10 minutes on a wire rack; remove from pans. Cool loaves completely. I only made half of the Rum Baked Apples, and there were still a lot left. These Rum Baked Apples would be good over pancake, waffles, oatmeal or vanilla ice cream. I might bake my sweet potatoes with the Rum Baked Apples in a casserole. I usually make the Candied Sweet potatoes with the marshmallows, but not that many people eat them, so I'm changing things up a bit.. I'm also using a re-made recipe for Green Bean Casserole, no cans only fresh ingredients. ( a later post). You have to be careful when you change tried and true recipes too much, or some family members might protest! Place all ingredients in an ovenproof dish and bake in 350 degree oven for 20-25 min, until apples are tender. 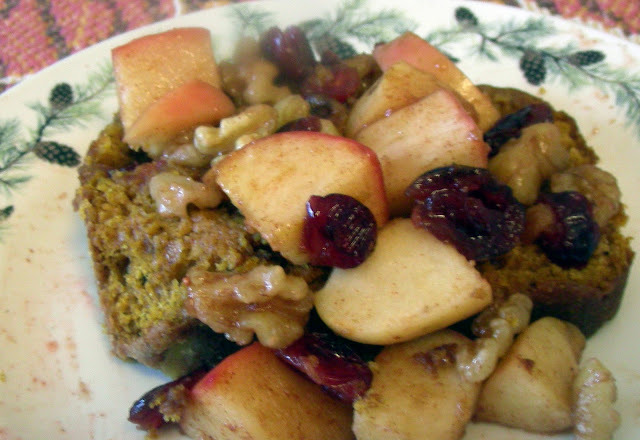 The pumpkin cake sounds wonderful together with apples and craisins and I love the addition of rum! Oh heck....I saw the word rum and my cursor just gravitated to this post all on its own. The bread looks awesome but then you add that beautiful laced apple and I'm there. Thanks for sharing this. So when I saw "rum baked apples"...I knew I was going to be one happy girl! This looks and sounds so moist and flavorful. I'm happy that you were able to cut back on the oil too! Thank you for sharing, dear. I hope you have a beautiful Sunday! Monet- Rum Baked apples are Wonderful! I think that I'm going to add sweet potatoes and make it sweet potatoes with Rum Baked Apples for Thanksgiving! Have a great Sunday! Your blog post title totally deserved that exclamation mark!! Yummy looking pumpkin bread and rum baked apples!! Sounds and looks delicious, I just wish I could taste it. this looks so delish! thanks for sharing.